Make your way to the Edinburgh departure point for 8:45 am (If you booked a departure point transfer at time of booking, your driver will collect you as noted on your voucher). Depart Edinburgh at 9:00 am, our journey takes us north over the Forth Road Bridge to the charming highland village of Dunkeld on the banks of the river Tay. From here we head into the Cairngorm National park and the ancient pine forests of the Rothiemurchus estate. Lunchtime will be spent on the beautiful shores of Loch Insh before a short forest walk takes us to the ruins of Loch an Eilein castle. Panoramic views of Loch Ness follow as we travel down to the banks of the famous loch and the village of Dores where we can do some “Nessie” spotting! 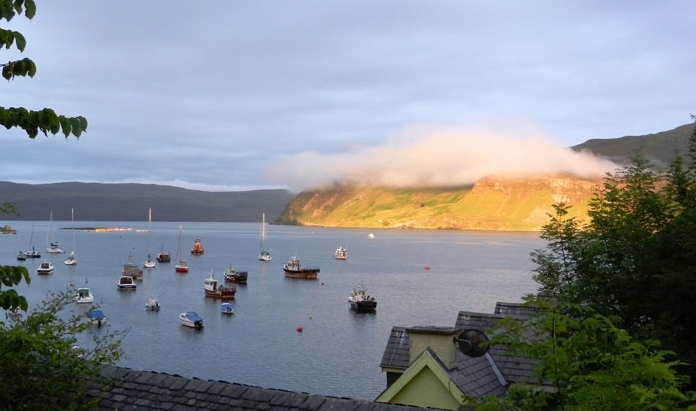 Then it's on to the shores of Loch Broom where we spend two nights at Ullapool. 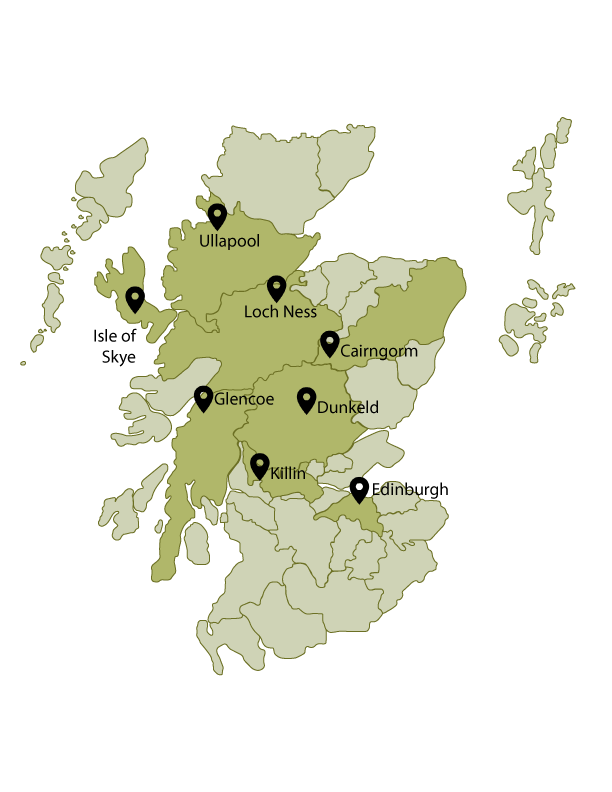 (*on some tours it may be necessary to stay in Inverness in which case the itinerary will be subject to slight changes). Today we visit the far northwest highlands and the grandeur, expanse and wildness of the mountains of Assynt with its abundance of wildlife. 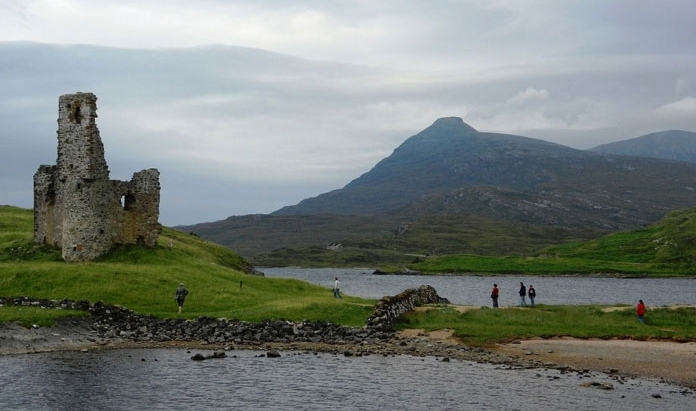 We will be immersed in the history of the area and visit the 15th century ruins of Ardvreck Castle, once the strong hold of the MacLeods of Assynt. The day is full of amazing views of some of Europe's oldest landscapes from the stunning white sand beach at Achmelvich Bay to the traditional fishing village of Lochinver. 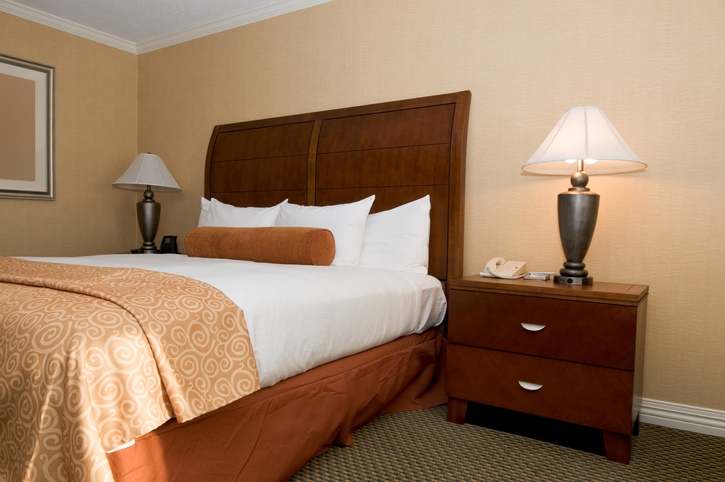 With the chance of seeing wildlife such as whales and red deer as well, this is sure to be a memorable day. Overnight in Ullapool. We leave Ullapool heading south to take in the drama of the River Droma as it plunges 60m down into the Corrieshalloch Gorge. 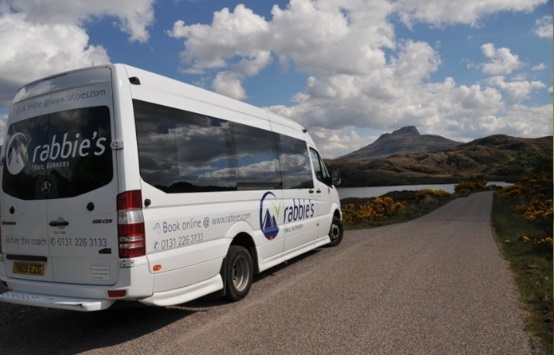 From here we travel past the mountains of the Beinn Eighe national nature reserve and along the picturesque coastline of Loch Torridon. 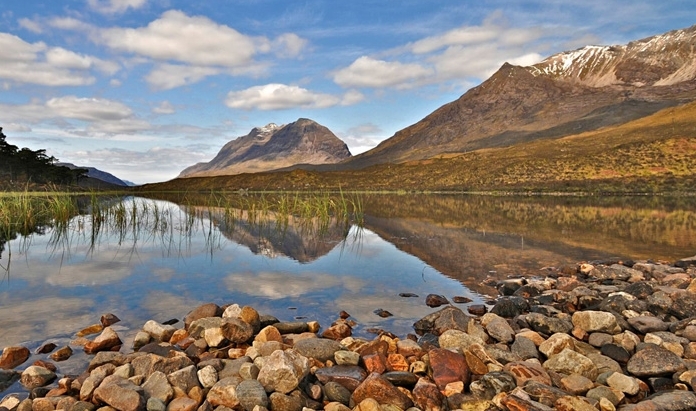 The tranquil setting of Applecross is your destination for lunch before taking one of the highest roads in Scotland, Bealach nam Bo, with its jaw-dropping views, hairpin bends and precipitous cliffs. In the afternoon we stop in “tropical” Plockton where we can see palm trees growing alongside Loch Carron and take time to enjoy its sheltered serenity. 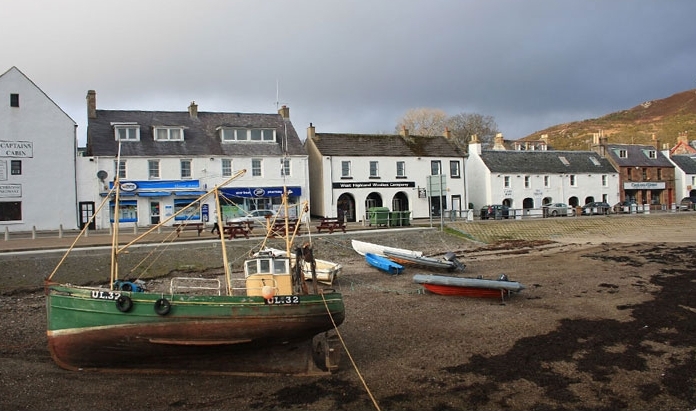 Then it's over the sea to Skye and the delightful harbor town of Portree with its friendly welcome. Is a very flexible day on Skye. There are many possibilities depending on the weather and our driver/guide will use his/her local knowledge to decide on the best day out for the group. For example we might travel north to the stunning Quiraing mountain pass and enjoy a spectacular walk through some of Skye's extraordinary geological scenery or visit the Kilt Rock, composed of basalt columns with its waterfall cascading over the cliffs and down into the sea below. 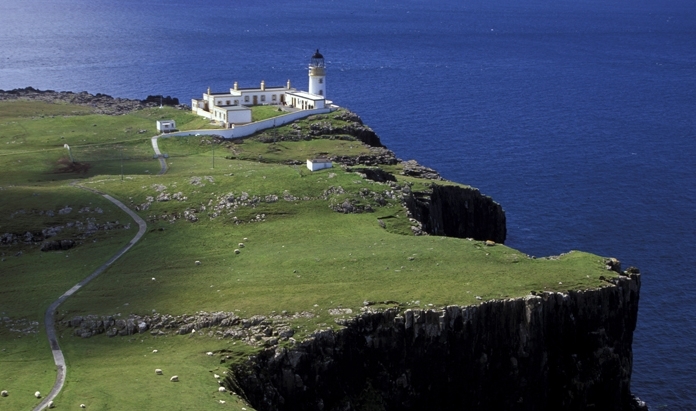 After lunch (on your own) we may travel to Neist Point for a walk out to the lighthouse at the most westerly point on Skye. Alternatively a visit to Dunvegan Castle, ancient ancestral seat of the Clan McLeod, may be possible. We return to our accommodation in Portree in the late afternoon where we enjoy a free evening in the village. We travel south from Skye stopping first at the famous stronghold Eilean Donan Castle, used in the film “Highlander”,set at the head of three (3) lochs as protection against Viking raiders. Continuing east through the rugged mountains of Kintail including the splendor of the Five Sisters, we drive down through Glen Garry past Britain's highest mountain, Ben Nevis, then onto Fort William for lunch. In the afternoon we will explore spectacular Glencoe, scene of the infamous massacre of the Clan Macdonald in 1692, before stopping in Killin for refreshments beside the Falls of Dochart, arriving into Edinburgh at around 7:00 pm. Our tour ends at Waverly Bridge in Edinburgh, where you will make your own way back to your pre-booked hotel.